DISCO4.COM - View topic - 10mm spacers make the original studs too short!!! 10mm spacers make the original studs too short!!! While I was said the opposite by the vendor!!! Would you think of a solution? Longer studs? And most importantly, where to find them? Alternatively, I am thinking of using larger spacers with replacement studs built into the new spacer? Apparently it starts at 25 mm? Any suggestion of where to get them from? My goal is to fit the Discoverer STT PRO 275/65R18 on a D3 and on the original wheels - which make it mandatory to add at least 10mm spacers I think. Otherwise I'll get the Compomotive 18 inches wheels which have 10mm more offset but ... would like to avoid this pricy option. As far as I can see on the company web site, they don't list a 10mm spacer for the D3 . they do list a 25mm one, which has additional studs for the wheels. Yes and it mainly links to BMW vehicles, no a mention of Land Rover. 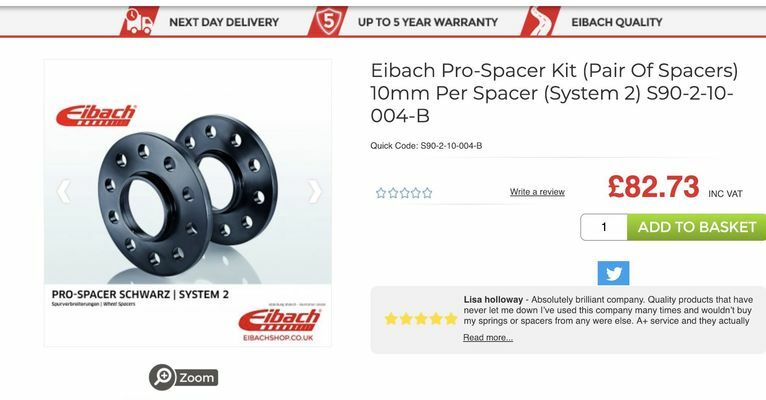 I went to their home page, looked up spacers and then the drop down menu for D3 , it came up with 25 and 30 mm spacers. anyway here is a screenshot. any idea how I could replace the studs with longer ones? otherwise I guess I will switch to 25mm with built-in replacement studs ... but I hope it's gonna work with the Cooper 275/65R18 and my 5" lift (I am a little scared it would touch in the wheel arches).